Danny Lipford with energy efficient Carrier Infinity heat pump. Open curtains and blinds on sunny windows during the day in cold winter weather to let in solar heat. Close curtains and blinds on windows at night during cold weather to hold the heat in the house. Close curtains and blinds on sunny windows during the day in hot summer weather to help keep solar heat out. Put on a sweater in cold weather and lower the thermostat to 68° F during the day and 62° F when sleeping at night. 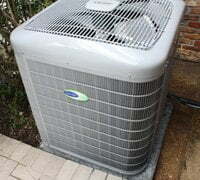 Dress lightly in hot weather and turn the thermostat on your air conditioning system up to 75° F.
Set the thermostat on your hot water heater lower to 120° F.
Dry clothes outside when possible, and clean clothes dryer lint filter and vent pipe regularly. Set clothes washer on cold water and run only full loads. Carrier Infinity Touch thermostat control. Seal cracks or gaps on the exterior of your home with caulk. Replace damaged or poorly fitting weather stripping and thresholds around windows and doors. Install plastic window insulation kits, such as those by Duck brand, on the inside of single pane windows. Change the air filter on heating/cooling system every 1-3 months. Replace incandescent light bulbs with CFL or LED bulbs. Install a programmable thermostat, and set it to lower the temperature in winter and raise it in the summer when you’re away from home. Install an insulated cover in the attic over dropdown stairs. Seal up leaks in HVAC ductwork with metallic duct tape and duct mastic. Installing new energy efficient windows on home. Have a HVAC pro inspect and clean your heating system each fall and the air conditioner every spring. Replace single pane window with insulated glass windows. Install an additional layer of insulation in the attic. Replace an older heating/cooling system with an energy efficient one with a high air conditioning SEER rating and high AFUE or HSPF heating rating, such as the Carrier Infinity Series. The Carrier Infinity 16 Heat Pump has a quiet, two-stage compressor with up to 17.2 SEER cooling and 9.6 HSPF heating efficiency ratings. The Carrier Infinity Touch Control thermostat is easy to program and can manage both the temperature and humidity levels in your home. The Carrier Infinity Air Purifier makes the air you breathe healthier by trapping and killing up to 95% of pathogens as small as 0.30 microns in diameter. Find out more in our article on Energy Savings Essentials. Had Energy Audit on home, and want to determine to fix those leaks. Best time to fix in Spring to save on air conditioning? Where do I begin in finding contractor to help? Also have water issue near window wells in basement.